NEW DELHI: As urgency grows to show results for its Clean Ganga mission, the Centre is turning to bacterial bioremediation techniques to cut down the time lag in commissioning of sewage treatment plants (STP). While STPs typically take two to three years to come up, large-scale application of bioremediation using ‘sewage-eating microbes’ quickens the process of improvement in the quality of river water, though only to an extent. Under bioremediation technique, the activated microbes eat up contaminants such as oil and organic matter. The bacteria play a vital role in treatment of sewage without causing any release of foul odour. The process thus also reduces stench from raw sewage. During the process of treatment, pollutants like heavy metals and toxic chemicals are reduced. The microbial dosing under the technique is done as per requirement assessed in terms of organic pollutants (microbial food) content in sewage. Having successfully tested the technique at Bakarganj Nala in Patna, the National Mission for Clean Ganga (NMCG) authority has recently approved two more pilot projects – one each in Patna and Allahabad – and planned to scale it up further by identifying 54 drains across four states – Uttar Pradesh (30), West Bengal (20), Bihar (3) and Jharkhand (1) – where bioremediation techniques can be used to prevent polluted water from flowing directly into the Ganga. 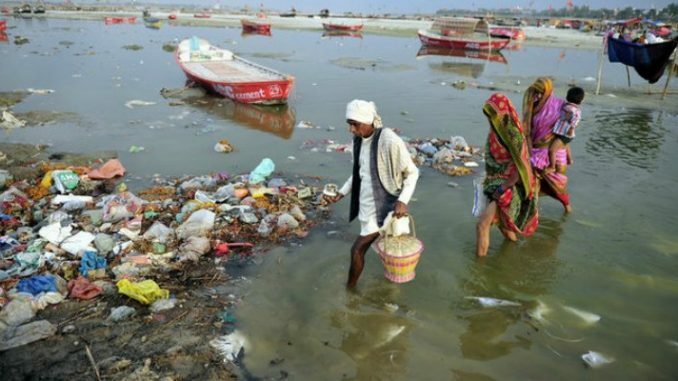 Referring to the long gestation period of STPs, the NMCG in a note said, “Since during the intervening period, sewage continues to flow into river Ganga and its tributaries, there is a need to manage the pollution load by in-situ treatments through various innovative technologies available across the globe. In-situ treatment is simple and easy-to-operate and does not require major modification of the drain”. The cost of the NMCG’s identified projects ranges from Rs 7 lakh to Rs 17 crore, depending on sewage flow into the drain. “These low-cost projects will be implemented as part of the Corporate Social Responsibility (CSR) activities of private/public companies. The NMCG has received several proposals related to in-situ bioremediation for drains and we are in the process of appraising it”, said an official of water resources ministry. Some of the drains identified by the NMCG for application of bioremediation techniques include Golaghat, Ranighat and Budhiyaghat drains in Kanpur; Sasurkhaderi and Mavaiya drains in Allahabad; Nagwa and Rajghat drains in Varanasi; Saklichand drain in Bhagalpur and Ramkrishna Mullick Ghat and Telkal Ghat drains in Howrah among others.